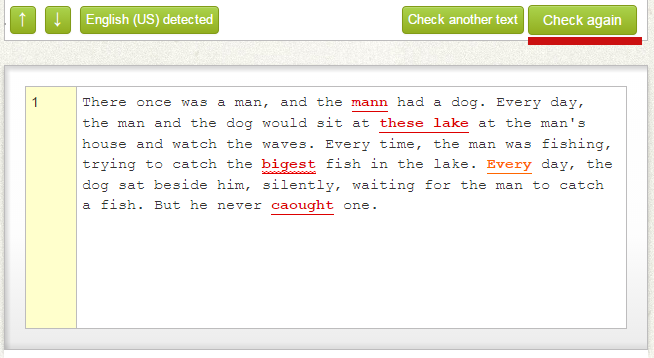 An online spellchecking tool oftentimes provides a lot more than simply giving you an output with corrected or marked spelling and grammar mistakes. To effectively use the online proofreading, one should be acquainted with all additional features such a service provides. Many functions of the online spellchecker are often overlooked even though they make checking your text and working with the already checked result so much easier! This article is supposed to be a help in finding out what else beside checking spelling and grammar the online spellchecker can do for you! Thus, we will look at the different buttons and options you have once you entered or uploaded your text, or provided an URL, and received the checked result already. When checking short texts consisting of few lines only, it’s not that difficult to get an overview over the mistakes made and detected. Yet, when you upload a text that contains several pages of a Microsoft Word or PDF document, it takes time to browse through it and check every single mistake or mark. 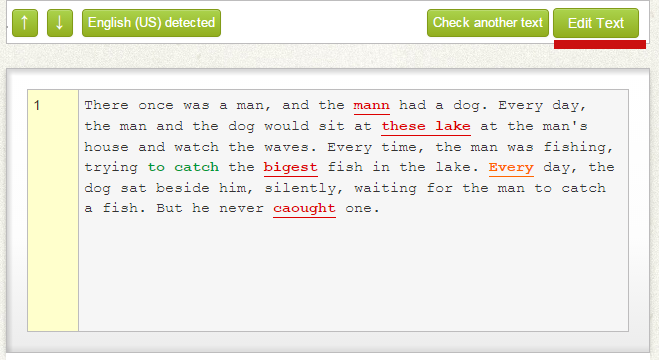 Using the up and down errors on the left hand side above your checked text, you can jump from one detected mistake to the next or back to the previous. In long texts with relatively few mistakes, this is the best way to check error by error without having to scroll down endlessly – and thus maybe missing a few markings. Do you know that feeling? You just let a spellchecker check your text and while reading through it you thought of something you want to add to the text. Or maybe you even found a textual mistake or wrong theory. Instead of having to go back to your original text, changing the content there, and uploading the whole document again, you can simply edit the already checked text. By clicking on the “Edit Text” button on the right hand side above your checked text, you have the possibility to add content, remove content, or simply edit your writing. That’s not it though. The possibility of having made a mistake by adding new content is always there. Luckily, you don’t have to go back to rule out this possibility. During the editing process, the “Edit Text” button changed into a “Check again” button. When you are done editing, simply click on it to get a spellcheck for the now edited text. 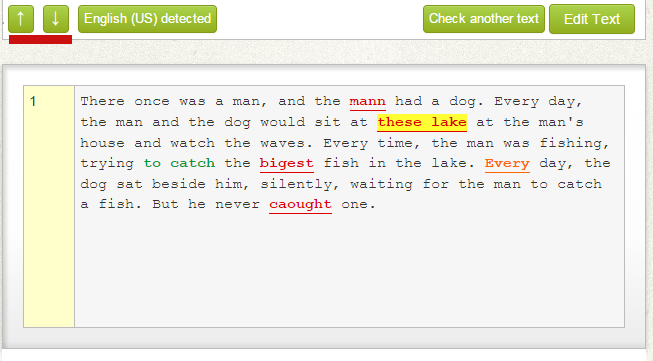 With the Online Spellcheck you have the possibility to share the unique and non-guessable links with other people which allows them to see the spelling and grammar checked result as well. What if you want to revoke that access, prevent alterations, or are handling sensitive data? If you registered for a free account with our service you have the possibility to protect the link with your login data. This means that only you are able to see the result of your spellcheck after loging in to the site. Last, but certainly not least, there are different options for you to save and forward your spellchecked result. Next to the most common options of printing your spellchecked result or downloading it either as a text or PDF document(as well as other, different document file types) you can send the result as an email or email attachment as well. To yourself, of course, but also to whichever email address you add in the field provided once you clicked on the “Email” button. This way, you can share your result with you colleagues, friends, family, students, teacher, professor… basically with everyone.